St Catherine's Hospice is thrilled to launch its third overseas adventure - a trek across the magnificent Saharan sand dunes. The local hospice is looking for intrepid explorers who would like to join them for the adventure of a lifetime and hike across one of the largest deserts in the world. Whether you are an experienced hiker, or have never so much as owned a pair of walking boots, joining St Catherine’s trekking team is a decision you won’t regret. You'll make life-long memories and friendships as you experience a natural wonder of the world. Taking place from 26 - 31 March 2020, the dazzling trip is the perfect chance to challenge yourself, while raising money to help terminally ill people in your community. Your £2,020 sponsorship, plus £300 registration fee, will help St Catherine’s care for more local people, and their families, so no one has to face death and loss alone. 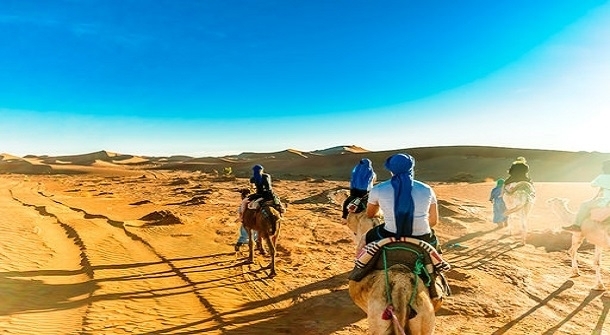 If you decide to sign up and make your steps count, you'll spend three days trekking through the Moroccan Sahara across ancient dried up river beds, sand dunes and vast sun-baked plains, accompanied by a knowledgeable support team and a herd of camels. In the evenings, you’ll be given a chance to experience the authentic Moroccan lifestyle as you enjoy traditional Berber cuisine, witness breathtaking sunsets, and fall asleep under a blanket of stars. What’s more, you’ll get to experience the bustling city life in both Marrakesh and Ouarzazate before and after the trek. And it's not a journey you'll embark on alone. St Catherine's will be with you every step of the way. The charity will be on hand to help you with your fundraising and training, and will host regular events before your trip so you can meet and get to know your fellow trekkers. If you or someone you know is ready to jump in and join the hospice’s Sahara Trek 2020, or you would like to find out more about this exciting adventure and hear from those who have completed a similar challenge, go along to the information evening at St Catherine’s Hospice, Malthouse Road, on 28 February from 6.30pm. You can also contact Michaela Clements on 01293 583063 or email events@stch.org.uk for further information.